Surprisingly, there are several kinds of Mustangs! The term "Mustang" is used to describe almost any kind of wild or feral horse. Within this designation, there are the Kiger Mustangs, which are small herds that have been found in remote areas, undiluted by outside blood. 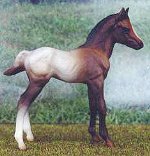 The Kiger Mustangs have very strong ties to their Spanish origins, and have strong genetic similarilites to the Spanish descended Sorraia, plus distinctive coloration; they are almost invariably some shade of dun. Other Mustangs also show strong ties to Spanish breeds, brought over by the conquistadors, these "Spanish Mustangs" show great resemblance to Lusitano horses in body shape. Also, some Mustangs can be designated as "Indian Horses". Thought to descend from the Horses of the American Native peoples mounts, some show a gait called the Indian Shuffle, which certain Appaloosa horses also show. This is a lateral gait, similar to a pace. There are certain associations that register the different strains of these horses. Also, the BLM- Bureau Of Land Management- feral horses, of various mixes. In addition, there are wild horses from countries other than the U.S., Like Australia's Brumby. I have some models to represent each different type. (Fallen King [m-tgr] x Bronzed Glory [m-tgr]- Prairie King) 5/4. Sire of Bowie, on this list. 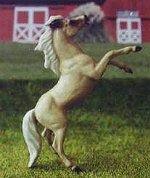 Breyer Mustang stallion from 'Pony For Keeps' set OF. Sire of Bombero, o/b Randa Garrett. (Tiger Eye [l] x La Senorita De Madrid [l]- Ka-Maw-I) Both parents live, but neither has further pedigree. Tiger Eye is considered to be one of the foundation sires of the modern Mustang. 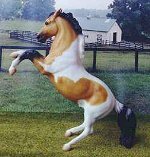 Breyerfest 2000 SR semi-rearing Mustang 'Sasparilla' glossy OF. Sire of Try To Get Me, o/b Alison Harpole, Nayati, o/b Cory Hartung and Smokin Ice, o/b Heather Mays. (Snakeyes [m-dhr] x TC Paint By Number [m-dhr]-Riksdag) 3+/5+ From Cory Hartung's breeding program, Blackjack's sire is buckskin, so he could carry a hidden dilute. H-R mini rearing stallion OF. CHAMPION and MEPSA 01 & 02 qualified. MEPSA 2003 Championship Top Ten. Sire of Midnight Sunshine, o/b Heather Gnidovec and First Light, o/b PHF. (Wildcat [m-dhr] x Jasmine [m-dhr] -Snake Bite) 4+/3+ Also from Cory Hartung's program. Sire of Chris Wallbruch's San Jacinto, and Endless Dreamer, o/b Heather Gnidovec. (Chief Yellow Fox® x Lucinda [m-dhr]-Fighter Cloud) Lines to Yellow Fox, Buckshot, Bandolero, Sams Red Eagle, Tie Fighter. Winner in Breed, placed in color. Sire of White Sands Fox, Rain Storm and Catalina. (Weatherman [m-phf] x Cassay [l]- unknown) Sire is also on this list. (Texas Espresso [m-phf] x Copper Cookie [m-phf]) Sire and dam on this list. 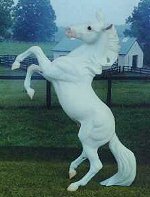 Breyer 'Titan Glory' SR 96 foundation stallion. (Hemlock [m-fh] x Tiger's Sunrise [l] grey- Phoenix II) 3/. Sire goes to Steen's Kiger and Cortez Amigo. Dam has lines to Tiger Eye and Little Bit. Sire of Mitakuye- Oyas'in, 99, o/b Moriah Schilders and Lomosi, o/b Cory Hartung. (Steens Kiger [l] x Nite Lite [m-phf]- Choctaw Ghost Dancer®) Dam is on this list. Sire of Mingan, o/b Cory Hartung. (Trouble [m-dhr] x Ruby [m-dhr]- Warrior's Heart) 4+/2. Sire's dam goes back to App lines. 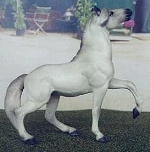 Breyer SR 'Rawhide' semi-rearing Mustang OF. MEPSA qualified 2007/08, 2nd of 46 Mustang. 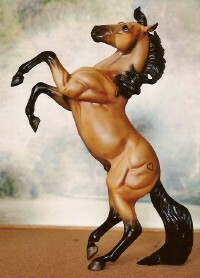 Breyer John Henry 'Cree Horse' OF. Sire of Apache Dynamight, o/b Brenda Varian and Foxfire Cyia, winner, o/b Delana Metcalf. (Sequoyah [l] x Little Valley [l]- Jack Slade) Both parents are live, registered Spanish Mustangs. Sequoyah is a most unusual color, called "blue". 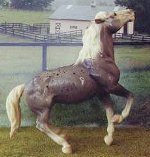 Breyer 'Smoky The Cowhorse' OF. Sire of Valley Girl, o/b Sherry Ball; Kaya, o/b Cory Hartung and Champion Blue Nueces, o/b PHF. (Challenge The Wind [m-tgr] x Texas Wildflower [m-tgr]- Golden Desperado) 3+/2+. 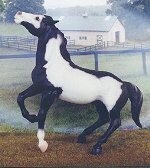 Breyer running stallion 'Mighty Buck' OF. Sire of multiple Champion Foxfire Daisimai, o/b Delana Metcalf. Sire of First Love, o/b Tayler McKee. Multiple winner and MEPSA qualifier. (Adoeete [m-j.hopkins] x Agridulce [m-j.hopkins]- Azul®) multiple lines to Azul, also Midnight Special, Blue Corn. 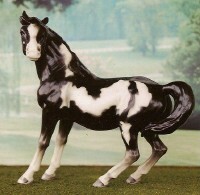 Breyer SR Mustang family stallion semi leopard App. Sire of Anoki, o/b Cory Hartung. 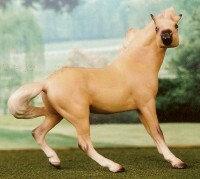 (Choctaw Sun Dance [l] x Wild Heaven [l]- Blue Crane) Full brother to a live Spanish Sorraia Mustang. 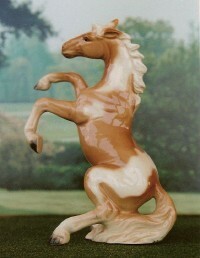 Breyer Mustang glossy app OF. 1st show- Winner of a class of 144 discontinued Breyers, MEPSA 01 qualified, MEPSA 04 qualified. Sire of Kali Deva Eyes, o/b Sherry Ball. 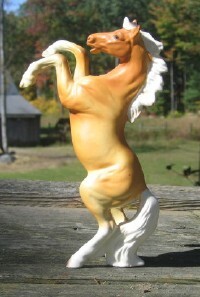 Breyer 'Wild Horses Of America' SR 93 foundation stallion. (Gold Nugget [m-rcs] x Tempestad de Arena [m-phf]- rangebred, Old Mexico) 2/1. (Five O Vigilante [m-outlaw] x Concepcione [m-tgr]-Warcry In Winter) 3+/5. To Warcry In Winter, War Bratt, Chief Half Moon. 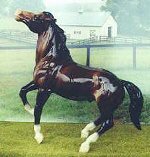 Breyer 'Rumbling Thunder' SR running stallion. Sire of Ms Hilton, o/b Sarah Carper. Breyer San Domingo last half-year Dakotah Indian horse OF. Sire of Manipi, o/b Cory Hartung. Foals: 1998 and 1999 only. (Special Warrior [l] x Mystic Maiden [l]- Thunder Cloud) Both sire and dam are registered Spanish Mustangs. Photo show winner, MEPSA 01 & MEPSA 02 qualified. Sire of Chris Wallbruch's Red Barchetta and Supstitious Vendetta, o/b Natasha Powers. (Joaquin [m-h.reaves] x NP Summer Squall [m-n.perrault]- Wild Glory) Sire is a Cerbat Mustang. 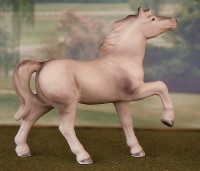 Breyer running stallion JCP SR from "Cowboy Pride" set. (Diablo Jade [m-cc] x Crimson Beauty [m-cc]) Modelbred. Lines to Black Flame, Vivid 2x, Candlelight Magic. Jade's color is very nice, soft and very nearly palomino. 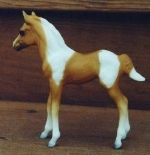 Breyer SR semi-rearing Mustang sorrel OF. (VnV Blue Poet [m-s.kroese] x Cozy In Shadows [m-s.kroese]- Bound To Shadows) model bred, with lines to Bear Claw, Eternal Shadow, Blue Cougar. 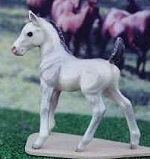 Breyer semi rearing Mustang OF. Sire of Dances With Wolves, 01, o/b Mary Lineman. (Cirrus [m-s.kroese] x Aztec Angel [m-s.kroese] - Mist of Dawn) Model bred, with lines to Wings of Fire, Golden Tide, Radiant Mist, Special Sunglow. (Sundowner® x Sweet Dream Lady®- black overo-Comes From Dream) Lines to Jack Slade, Doby, Blue Corn, Miss Crazy Horse, San Domingo, Special Warrior. Lefton copy of HR Abu Farwa OF. Sire of Dante, o/b PHF. (Devils In The Details [m-phf] x Masadas Way®- Chief Masada) Addt'l ines to Majuba, Midnight Special. (Silver Bullet® x Sulphur Rose®) no further pedigree on dam; little on sire. These live horses were wild caught or feral a few generations back. They have genetic markers for Sorraia lineage, and are registered as Sorraia Mustangs. The Sorraia is endangered in its native country of Portugal. Blue Ribbon Spanish Barb OF. Dam of Foxfire Cyia, 97, o/b Delana Metcalf; Cisco, 00, o/b PHF and Deseret, 03, o/b PHF. (rangebred, Old Mexico) Dam of Inca Empire, on this list. (War King [bso-d.peters] x Chocolate [l]) Spanish Mustang and Barb blood. Dam of Vengeance, 88, o/b PHF; Endless Dreamer, 93, o/b Heather Gnidovec; Try To Get Me, 94, o/b Allison Harpole; Hania, 97, o/b Cory Hartung and Superstitious Vendetta, 98, o/b Natasha Powers. (Battle Hymn [m-rcg] x Sugarcoated Candy [m-dhr]) /3+. Dam of Viper, on this list. 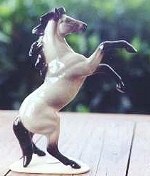 Japan metal micro mini copy of Hartland tinymite Quarter Horse. (Chocolate Mousse [m-dhr] x Lucinda [m-dhr]) 3+/3+. From Cory Hartung's ranch, and descended from Bandolero, a Champion. Her dam is also dam of Cinda's Sandstorm, so they will not be bred. Dam of Midnight Sunshine, '91, o/b Heather Gnidovec, Rebel Dreams, '92, o/b Betsy Bissell; Apache Dynamight, 95, o/b Brenda Varian; Valley Girl, '97, o/b Sherry Ball; Pajarita, 02, o/b PHF and Sangria, 04, o/b PHF. Dam of Ice Mint, 90, o/b PHF and Blue Nueces, 2004, o/b PHF. -Pedigree change-(Choctaw Ghost Dancer [l] x Broomtail Jane [®]-Majuba) 3+/3+. Has all live lines. Dam of Purple Haze, 91, o/b PHF; Laken, 94, o/b Melinda Blegan; Sakima, 00, o/b Cory Hartung and Dances With Wolves, 01, o/b Mary Lineman. Dam of Chris Wallbruch's Red Barchetta, 1997 and San Jacinto, 1999. Cm etched SM TB mare. (Crash [m-cc] x Anything Noble [m-ra]- Chief San Domingo [l]) /3+. Dam of Wakoyantonke, 93, o/b James Hopkins; Chevayo, 97, o/b Cory Hartung; Rich And Famous, 03, ob PHF and Rain Storm, 04, o/b Tayler McKee. Dam of Manipi, 98, o/b Cory Hartung. 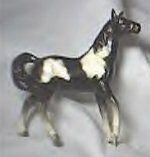 Breyer 1972 Indian pony #177 OF. Multiple Champion. MEPSA qualifies yearly. Dam of Smokin Ice, 96, o/b Heather Mays; multiple Champion Foxfire Daisimai, 97, o/b Delana Metcalf; Ms Hilton, 98, o/b Sarah Carper and Spider Kiss, 04, o/b PHF. (Kiger Hombre [l] x Paloma Manana [l]- Tiger Eye) Both parents are live Spanish Mustangs, sire a handsome yellow dun Kiger and dam a silver buckskin mare with registry in the American Indian Horse association, as well as the Spanish Mustang book. 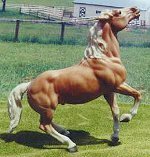 Breyer 'Ginger' OF from the Hanoverian family. Dam of Overturned, 97, o/b Cory Hartung; Fernando, 98, o/b Chris Wallbruch; SMS Catalina, 99, o/b Amy DeWaal; and Khaki Plan, 02, o/b PHF. 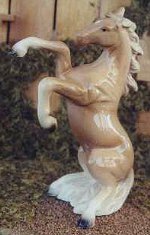 Hagen Renaker mini mustang mare 'Sedona' OF. Dam of Bombero, 98, o/b Randa Garrett and Ghost Rider, 03, o/b PHF. (Freedom [m-foxh] x Starlite [l]-Tiger Eye) 3+/. Dam of Lightning, 98, o/b Melinda Blegan; Mitakuye- Oyas'in, 99, o/b Moriah Schilders; and Dustflower, 02, o/b PHF. (Blackhawk Won [TB-m-tgr] x Someone Else's Dream [m-tgr] 88 bay roan) 5/3+. 1/2 TB Mustang from Sherry Ball's Thunder Glen. Excellent TB lines to Bold Forbes, Summer Tan, Chateuagay, Heliopolis. Mustang dam goes back to rangebred. Dam of Aponi, 98, o/b Cory Hartung. Dam of Libre Aumentó. 99. o/b Sarah Carper. (Moon Spots® SMR742 bay app x Liona®- Broom) Sire is a winning Endurance racer- 1988 UMECRA Competitive Rookie of the Year; UMESRA Top Ten Competitive Lwt. ; UMECRA Competitive High Point Stallion;UMECRA 4th place Competitive Horse (700 miles) Dam is also a winning Endurance horse; the first SMR NATRC Nat'l Champion. 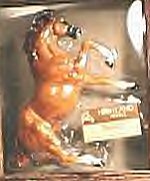 Breyer classic Mustang mare OF. Dam of Panic Switch, 98, o/b Vicki Griffiths; Kali Deva Eyes, 99, o/b Sherry Ball; Anoki, 00, o/b Cory Hartung and Sanskrit, 05, o/b PHF. Dam of Kajika, 00, o/b Cory Hartung and White Sands Fox, 04, o/b Sherry Ball. (Kiger Hombre [l] x Wallowa's Fancy Lady [l]- Wallowa Kiger) 1/2. Parents go back to wild, but both are live Kigers. Dam of Sandy Shadows, 02, o/b Deborah Kaiser and Llano de Espana, 04, o/b PHF. (Mesa Verde [m-phf] x Rising Sun [l]- rangebred) Sire is on this list, dam is a beautiful, rangebred mare. Reserve Champion 1st show. Winner, Winner Headstudy. MEPSA qualified 2008. Dam of First Love, 03, o/b Tayler McKee. 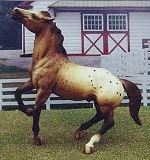 Breyer classic Kelso 'Geronimo' OF. Dam of Macarena, 04, o/b PHF. (Riddle Mountain Redman [l] x Medora [l]- Chief Santa Domingo) Sire is a wonderful red dun Spanish Mustang, and dam is a medicine hat mare. Breyer Nursing mare OF from Gift set. Dam of Wynona, 03, o/b PHF. (VnV Wolf At Dusk [m-s.kroese] x Twilight Mist [m-s.kroese]- Paper Tiger) model bred. Kiger Magic, Kiger's Ecstasy. Paper Tiger, Wild Promise. Dee Ann Kjelshus 'Twisted Sister' resin by Janet Bonney. (Dunkareem [m-s.kroese] x Meoquence [m-s.kroese]- Choctaw Three) All live lines. Yellow Fox, Ka-maw-i, Choctaw II, Sirbee. 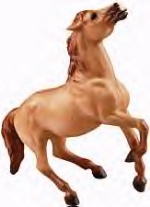 Breyer SM OM QHM OF. (unknown sire x unknown dam) Rangebred, as a Brumby would most likely be. This mare has a lot of TB blood in her- an Australian Waler stallion with the herd she was captured from would have probably been her sire. Franklin mint TB mare and foal OF. Hagen Renaker mini Mustang foal OF. HR mini Mustang foal 00. Breyer 'Mustang' foal from Fine Horse family.